A success in imaginative storytelling, even though this type of story is becoming a Hollywood cliche. Made for denzel Washington fans first and foremost, but also any people that like a good end-of-the-world story. The world has been scorched. At least that’s what Eli (Denzel Washington) tells us. A war, most likely nuclear, tore a hole in the sky and let the harmful rays of the sun in. “The Book of Eli” is quite possibly the first post-apocalyptic movie I’ve seen that doesn’t start out showing us what year it is. All we know is the Earth has come to resemble the landscapes Mad Max used to traverse, and the people inhabiting it are just as unfriendly. It’s becoming quite cliché to see endless lines of burned-out, abandoned cars on broken down freeways, but how else do you convey the sense of dread and loneliness that comes from a movie like this? “The Book of Eli” does not linger on its epic depictions of destruction, instead the carnage around Eli is blends in as a backdrop to an unforgiving world that has seen its share of horrors. The previews for the movie show Denzel Washington with a giant machete, hacking people up almost “Matrix” style until he’s the only one left standing. Where did he learn to fight like this? No one knows, and it’s never revealed. Well, to say that it’s never revealed is misleading, it’s hinted at, but it doesn’t matter in the slightest. All we know is that Eli is traveling West and he has in his possession, a book. In this desolate day and age books, not to mention literacy, are a rare commodity. Turns out there’s an ironically named man called Carnegie (Gary Oldman) who leads a band of ruthless thugs in a small town that Eli has to pass through to get supplies. Carnegie is also a purveyor of books, and is looking for one in particular. Isn’t it convenient that the book he’s looking for is the same book Eli is carrying with him? While the previews for ‘The Book of Eli’ would make you think that this movie is non-stop action, it is more of a melodic plodding. Sure there are scenes of intense ultra-violent gore as Eli slashes his way through hordes of unwashed thugs, but most scenes involve watching Eli as he walks large spans of roads as industrial, echoing music invades the soundtrack always providing an anxious and mysterious presence. On one hand “The Book of Eli” is an entertaining popcorn action romp with swordplay, gunplay, and grenadeplay. The film does a great job of giving us a sense of what it would be like to live in that time. At one time, as Eli is talking about the Old World (the time we’re living in right now) he says people had more than they need and they didn’t know what was precious. How perfect. Water above all else is a coveted commodity, but the book Eli is carrying could be even more valuable. Bartering is back in full swing, as money is completely obsolete. Some people have resorted to cannibalism, others are still trying to make an honest living. I can’t quite put my finger on it, but “The Book of Eli” has a slightly different feel from your run-of-the-mill post-apocalyptic wanderer movie. It’s got an interesting message to bring forth that it isn’t necessarily spelled out to the audience. The ending does throw a few curveball surprises at you that, I guarantee, you won’t see coming. Upon first thought about the surprises you’ll think the movie doesn’t make a lick of sense, but upon repeat viewings I think it’ll come more into focus. The film does falter with its ending though. The end scene is just ridiculous, and goes against the entire premise and spirit of the movie. See, Eli killed because he had to. He never acted upon anyone that didn’t act upon him, but the ending flips that moral on its head. I won’t spoil the ending here. 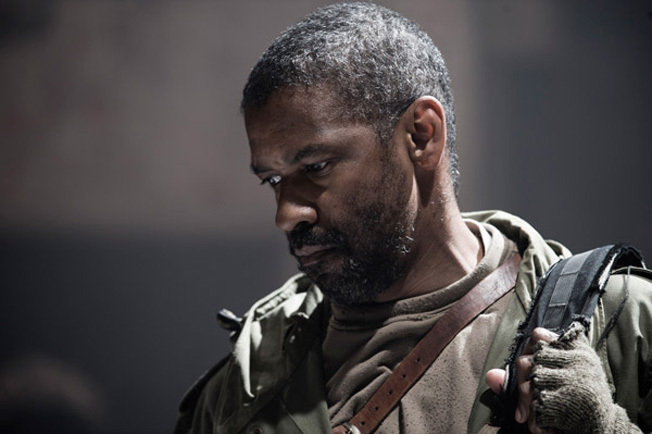 You won’t be disappointed if you go to the theater to see “The Book of Eli.” It’s intense, thought-provoking, and Denzel Washington is truly the only actor out there who can stand there, do nothing, and look menacing enough to kill.